In many of the best pillows for side sleepers reviews that have been previously published online, several materials have been introduced, each claiming to be the best. Memory foam and latex are some of the most common, but one that is quickly gaining higher popularity is ComfySleep Buckwheat Pillow. Is this going to provide the best bang for the buck? Keep on reading and we will let you know. Made from Buckwheat: This is perhaps one of the best features of this product, giving it a distinct advantage from most of the models that can be purchased in the market. Buckwheat hulls are stuffed in the pillow. You can add or lessen the hulls depending on the level of firmness that is preferred. Buckwheat is a material that is supportive, comfortable, and long-lasting. It does not easily compress, which means that it can withstand long-term use. 100% Cotton Twill: The outer case of the pillow is another feature that should be noted. It is made from high-quality cotton, which is hand-dyed and micro-brushed. This material is known for being gentle in the skin, and hence, won’t cause irritation throughout your sleep. Washable Outer Cover: Through time, it is inevitable that the pillow will attract dirt and dust. To keep it clean, have the cover washed now and then, specifically when you notice a change in its color. The good news is that the outer cover is removable and washable, making it easy for you to maintain the pillow at its best. Personalized Comfort: One of the things that you will love about ComfySleep Traditional Buckwheat Hull Pillow is its ability to conform to the shape of the body of the user. With such, there is no wonder why this side sleeper guide believes that it is indeed one of the best within the product category. 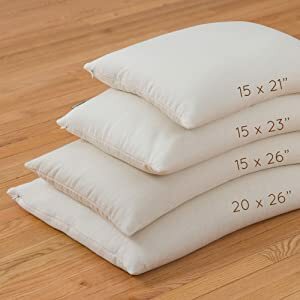 Long-lasting: It can be frustrating to be using a pillow that does not withstand long-term use. One of the reasons why this is an impressive choice is the fact that it is meant to be durable. Even through time, you will notice that its quality will remain superior. For this reason, it is indeed going to provide the best bang for the buck. Adjustable Firmness: Since it is made from buckwheat hulls, which can be added or lessened when you want, users are always in control with regards to how firm it can be, depending on the amount of the hulls that are used. Can be Noisy: While buckwheat hulls can be beneficial, it can also be a downside. One of the most commonly reported problems is the noise produced by the hulls, especially for people who move a lot when they are sleeping. The volume of Hull Decreases through Time: With your movements, the hulls can also decrease in size through the years. With this, you need to buy a replacement within a certain period. In sum, if you are looking for the pillow for neck pain side sleeper, ComfySleep Buckwheat Pillow can prove to be an exceptional pick. In spite of the fact that the volume of hulls can decrease over time and even if it can create noise, the drawbacks are outnumbered by the benefits. It can provide personalized comfort, it has organic materials, and it is long-lasting. All of these things make it one of the best within the product category.